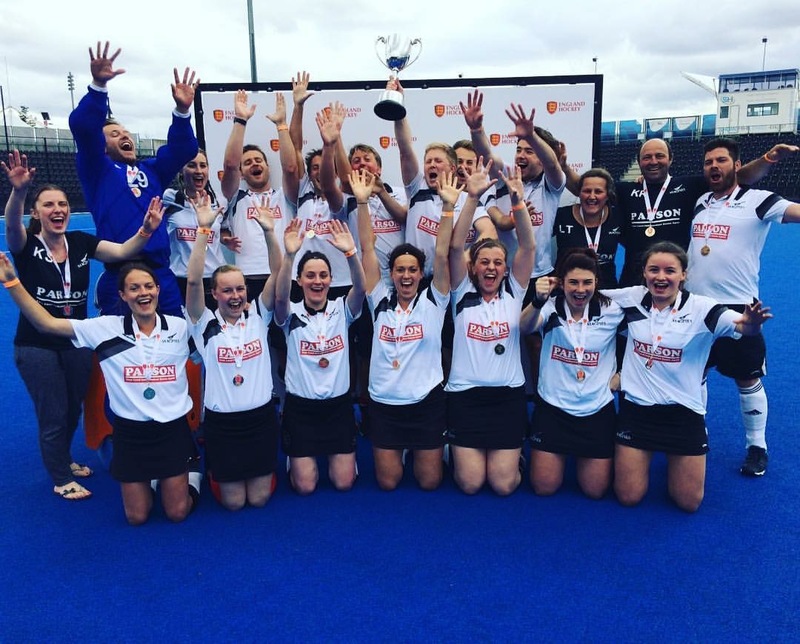 After triumphs in 2004 and 2015 the Magpies’ squad – kindly sponsored by Parson Estate Agents – and their supporters assembled at Lee Valley Hockey Centre last Saturday in search of a third win in England Hockey’s Mixed Trophy which this season attracted an entry of 148 teams making it EH’s most popular competition. After missing the signs to the Westfield Shopping Centre I toured the area trying to find somewhere to park eventually settling for a well-known supermarket where a fellow customer kindly gave me a lift to the stadium on a hot day in time for the eagerly awaited semi-final clash with Spencer HC. Maria Andrews put Magpies ahead early in the game with a typically fierce penalty corner conversion but Spencer were soon level thanks to a superb reverse stick shot by ex-Magpie Duncan Graves. Unfortunately for him and his team Duncan was injured in making the shot and his weekend’s hockey was over. His shot almost did the same for Magpies’ goalkeeper Chris Leek who took a frightful blow and the game was held up for several minutes. Magpies then had a bad spell but to their relief and that of their supporters they were back in the lead against the run of play seconds before half time when Maria fired one of her trademark reverse stick shots high into the net. Encouraged by this change of fortune Magpies dominated the second half (despite two yellows) inspired by Tim Whiteman in midfield. Midway through the half Lucy Whiting won the ball and crossed for Simon Hipwell to run into the circle to score in spectacular style. Another goal for Simon who has found his scoring touch in the latter part of the season to go with his mounting card collection! Maria then scored again to take her Mixed total for the season to nine (to add to her seventeen for the 1sts) and in a spirit of goodwill I will record this as completing her hat-trick! Captain Leigh Sitch was also in commanding form for Magpies in this 4-1 win with another outstanding defensive performance in addition to his three attacking forays causing one spectator to say he didn’t realise how quick Leigh is about the pitch! We then saw Khalsa (Warks) recover from two down to beat Stourport 3-2 in the other semi with two late goals. Khalsa looked a much stronger team than when Magpies beat them 5-0 in the quarters at Weybread last season so our squad was warned what to expect in the final the next day. The appalling terrorist outrage in London on Saturday evening was marked by a minute’s silence in the stadium on Sunday. Stourport beat Spencer 3-0 in the 3rd/4th place play-off and with the number of Magpies’ supporters swelling by the minute it was time for the final played in coolish and mainly overcast conditions. Khalsa were soon on the attack and they scored after three minutes following an attack down their right. Magpies are rarely behind in their Mixed games. How would they react to this setback in front of their enthusiastic support? The answer was encouraging and they took the game to their opponents without playing at their best. Five minutes before half time after good work by Leigh, Tim and Simon the ball was slipped by Maria to Lizzie Clymer who took the chance in fine style to bring the scores level. The second half was a tense and exciting affair with Thomas Ridley in midfield and Andrew Bedwell in defence playing particularly well for Magpies. Both sides had chances at penalty corners in the last few minutes and Maria was denied by an excellent stick save by the Khalsa keeper. So players and spectators alike were left with the dreaded shuffles introduced just for the final. It was 2-2 after each team had taken their five. Scorers for Magpies were Tim Whiteman and Robbie Kinsella with Chris in goal making some excellent saves with one surprisingly resulting in a penalty stroke for Khalsa which they converted. With nerves jangling (at least in the crowd!) it was now time for the decider. Tim stepped up to coolly convert once again leaving the next Khalsa player needing to score to extend the shootout. With tension mounting even higher Chris forced him to shoot wide and with it a hard earned victory for Magpies in front of their jubilant fans including sponsors Kevin and Jan Parson. The stadium announcer rightly called it a compelling final in which both teams played their part with so little between them. It is ‘very well done’ to all members of the Magpies’ squad with special thanks to captain Leigh for all his hard work in organising the team throughout the season including the hotel and other arrangements for the finals weekend. Congratulations to Leigh, Lizzie, Thomas, Maria and Katherine Ridley who after Saturday’s game were invited to the England Mixed trials. The weekend marked almost certainly (at least for now) the last game for the club by Maria who this season in particular has shown what an outstanding goal scoring talent she has. She leaves with our thanks and very best wishes for her hockey and further studies. She will always be welcome back at Weybread. Squad: Leigh Sitch (captain), Chris Leek (GK), Andrew Bedwell, Jess Howland, Katherine Ridley, Thomas Ridley, Simon Hipwell, Lauren Mickleburgh, Lucy Belsey, Richard Larkin, Tim Whiteman, Maria Andrews, Lucy Whiting, Lizzie Clymer, Robbie Kinsella, Lauren Barber, Laura Tibbenham, Katrina Sitch (coach) and Kevin Ridley (manager). Club secretary Daphne Beckett has 10 complimentary tickets worth £45 each. Please contact Daphne at daphnebeckett@gmail.com if you are interested in attending. If demand exceeds supply a ballot will be held on Sunday 11 June. You are cordially invited to this ticket only event which is always one of the most enjoyable in the club’s social calendar. PS. AGM – Thursday 22 June in the clubhouse at 8.00pm. The agenda will be issued very soon.